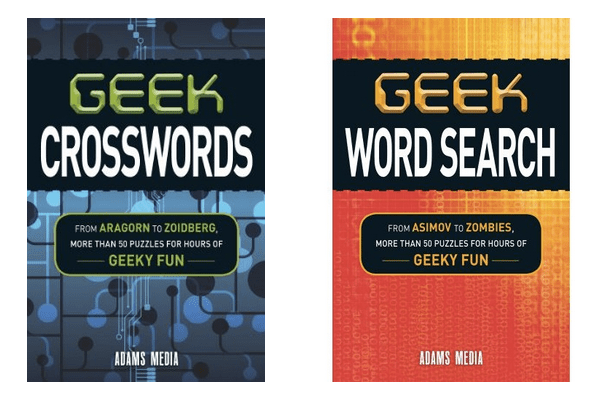 If you love crosswords and word searches, then you’re going to want the newly released Geek Crosswords and Geek Word Search books by Adams Media. Instead of the usual, everyman puzzles you find in most books, these are tailor-made for us geeks. Each book has over 50 puzzles that are divided into three sections. You start off on level one, which are the easiest puzzles, and work your way up to level three. The crosswords especially will have you wracking your brain trying to remember what the Ghostbusters did before they were fired and which of Tarantino’s movies starred Pam Grier. The puzzles are themed, so you have an idea of what kinds of geek tidbits you’ll need to sort toward the front of your brain before you start. Your knowledge of Indiana Jones , meteors, William Shatner and Speed Racer will all be tested. In case your memory isn’t quite what you thought, there are answer keys in the backs of the books, but try not to cheat and look things up. It’ll seriously damage your nerd cred and even if no one else knows, you’ll know you were bested by a puzzle. Geek Crosswords and Geek Word Search are now available for $8.95 each. They’re the perfect way to pass the time while trapped inside on these cold winter days. I received these books for review purposes. ← My Son’s iPhone Pinewood Derby Car!